Air Pacific as it used to be known, hasn't always had a great reputation with the luxury crowd. Its rainbow coloured livery and service being more package deal than posh. 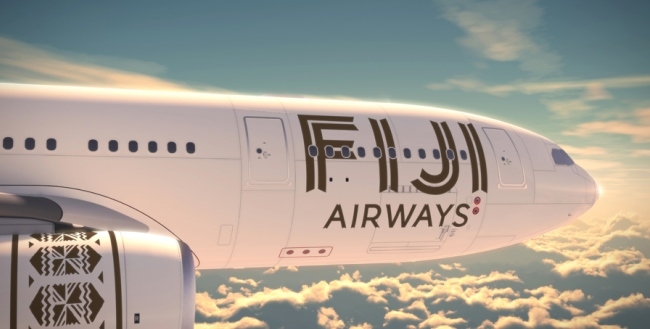 However with the change of name this June to Fiji Airways (technically a change back, since this what the airline was called in the dim and distant past), spanking new A330-200s on the Los Angeles-Nadi and Sydney- Nadi routes and a new business class, things are looking up... and up. Fiji Airways business class is called Tabua Class (pronounced Tam-Boo-Ah) which has a special meaning for Fijians. The presentation of a Tabua in local custom is a solemn, formal ceremony and is given only in very special circumstance as a token of appreciation or 'to demonstrate loyalty, goodwill and respect'. Sounds promising. 'It smells like a new car' says my son as we board the plane and the new cream leather seats do indeed remind me of a fresh-from-the-showroom limo. Not a bad thing. The combination of classy cream and coffee coloured livery is very smart it has to be said. The use of Masi patterns - Fiji?s traditional textile known as 'cloth of the gods' especially created by celebrated local Fijian Masi artist, Makereta Matemosi.- curling across staff uniforms, blankets, pillows and eyeshade give you a feel of Fiji before you even leave the ground. As does the fact that the first image to great you on the (wide) TV screen is of turquoise blue water. Bliss. The tail fin of the plane also sports the new coffee Masi pattern.Changing its name back from Air Pacific to Fiji Airways also helps the airline embrace its heritage. What of the practicalities? The tray table is big enough for a laptop, so you can work as well as eat off it (although not at the same time) and also pivots out of the way so you can easily get in and out of your seat. Brownie points for that. There are also plenty of nooks and crannies for storing things including a good sized side pocket. The seat is as comfortable in its upright position as the afore mentioned luxury limo seat and wide enough for a Fijian rugby player (no mean feat). It has to be aid that the seats aren't completely horizontal; they recline to slight angle. However there is plenty of padding. Not perhaps up to the standard of entertainment -extravagant airlines such as Virgin Atlantic, nevertheless there is enough choice to keep me happy for the duration. For those who like the tech spec - each of the seats in Tabua business class includes an inbuilt AC power and USB outlets plus a 15.4 inch LCD screen which runs Panasonic?s eX2 content-on-demand system. Bula. The warm Fiji welcome maybe a cliché but it's true. Flight attendants have that same laidback charm, so there's an island mood before you even land in Fiji. It is like being welcomed onboard by a favourite auntie or uncle. That doesn't mean staff aren't efficient, they are. Let's be brutal. Food has not always been Air Pacific's, or indeed Fiji's strong point. So the lunch service was a pleasant surprise. No named chef for this business class. Not fancy, not French but good hearty fare just the same. 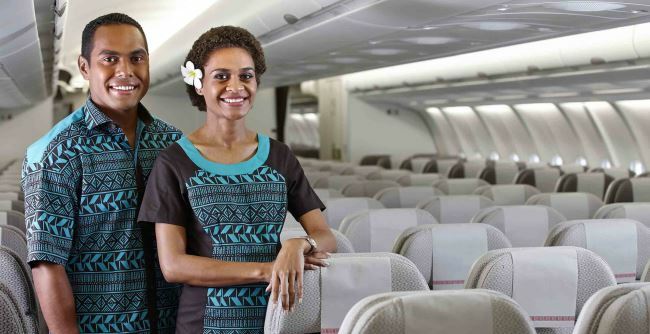 Fiji Airways new aircraft, new livery and new Tabua business class lift the airline into a new class altogether. Gone is the rainbow tail and package-holiday vibe. Replaced by a sleeker ,more efficient seeming airline. We even took off on time. By the end of 2013, all three A330s will be running and Fiji Airways will have retired its old Air pacific its Boeing 747s and repainted and upgraded all of its Boeing 737s in the coffee-cool livery.